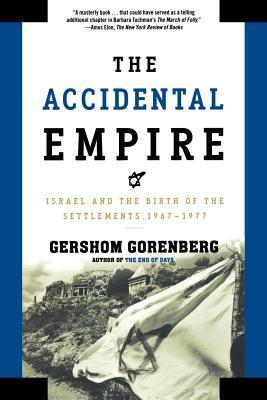 In The Accidental Empire, Gershom Gorenberg examines the strange birth of the settler movement in the ten years following the Six-Day War and finds that it was as much the child of Labor Party socialism as of religious extremism. The giants of Israeli history—Dayan, Meir, Eshkol, Allon—all played major roles in this drama, as did more contemporary figures like Sharon, Rabin, and Peres. Gorenberg also shows how three American presidents turned a blind eye to what was happening in the territories, and reveals their strategic reasons for doing so. Drawing on newly opened archives and extensive interviews, Gorenberg calls into question much of what we think we know about this issue that continues to haunt the Middle East. Gershom Gorenberg is the author of The End of Days: Fundamentalism and the Struggle for the Temple Mount and co-author of Shalom, Friend: The Life and Legacy of Yitzhak Rabin. The Jerusalem correspondent for the Forward, he has also written for The Jerusalem Report, The New York Times Magazine, The Washington Post, The New Republic, and The American Prospect. He lives in Jerusalem with his wife and three children.